The Swagtron Swagboard T1 comes with a price tag that should include so much more, but instead leaves much to be desired. From electric bikes to hoverboards, consumers are taking full advantage in the sudden surge in sophisticated rideables hitting shelves. The Swagtron Swagboard T1 is one such hoverboard, letting you zip from one place to another with stable and responsive controls. We recently tested the Swagtron Swagboard T1 around the streets of Portland, Oregon, to see if its relatively short range warrants the high price. The Swagboard T1 incorporates a fairly vanilla, and dare we say, dull design for the rather hefty price. While many newer models are incorporating extensive LED light kits along the front, back, and even wheel wells, the Swagboard keeps these lights to the bare minimum. The front of the unit features a pair of headlights each with 8 blue LEDs to illuminate the road ahead. Two non-slip ribbed, foot pads ensure a firm grip during use and a battery indicator in the middle of the deck allows riders to gauge the battery life while taking in the terrain underfoot. Oddly enough, the Swagboard T1 looks almost identical to the MegaWheels Hoverboard currently available for only a fraction of the price ($123). Without a Bluetooth speaker, app, and a rather traditional build the unit literally does nothing to stand out in a competitive crowd. The only real physical difference aside from available colors is the fender design. The fenders on the Swagboard T1 cover the top of the 6.5-inch tires and quickly jet toward the deck exposing the front and back of the tire. This allows the tires to act as bumpers, minimizing scuffs and knicks during tight turns. This may sound like an irrelevant design point, but the exposed tire at the base of the deck does wonders when it comes to preserving the delicate paint job. One thing to note is that at more than 20 pounds, the Swagboard is a hulking brute. Without a handle or even a recess beneath the deck for easy gripping, this unit can be quite the load to haul between uses and generally doesn’t lend itself to portability. There’s little setup involved with the Swagboard T1 once the unit is fully charged. There is a steep learning curve when it comes to riding a hoverboard for the first time and beginners should practice next to a chair or doorway to help with stabilization. It’s not a bad idea to have another person assist with getting on and off of the hoverboard the first few times. Once the rider is comfortable standing on the hoverboard, it’s important to practice basic driving skills in the most optimal conditions. A flat, firm, indoor surface is ideal during the learning process. Once forward, backward, and directional changes have been mastered, feel free to take this Swagboard T1 on the road. It’s probably a smart idea to invest in a helmet and protective pads as well. Because, as we learned, if you ride a hoverboard for any extended period of time, you will fall down. Trust us. We learned the hard way several times. One thing we’ve noticed during our recent hoverboard tests is just how unstable some hoverboards feel even at speeds well below the listed top speed. This sensation is oddly reminiscent of the speed wobbles many skateboarders experience on downhill stretches. As a result, hoverboard riders may need to operate at a much lower speed than they may like for safety and comfort. Pleasantly, this wasn’t the case with the Swagboard T1, we routinely cruised full speed ahead at 8 miles per hour (mph) evenly. The hoverboard handles just as uniformly at 4 mph as it did at 8 mph without the slightest wobble underfoot. With the two platform design, each wheel operates independently of the other. This allows riders to perform tight turns and easily navigate even the narrowest of corridors. 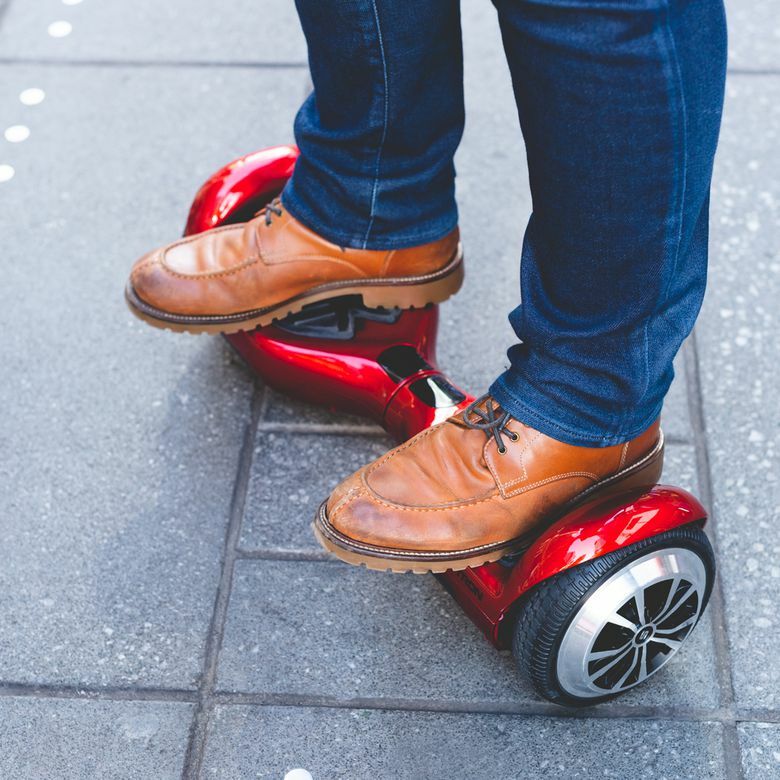 However, the Swagboard T1 is certainly only meant to traverse the most ideal of road conditions, as the smallest pebble or crack along the sidewalk can easily spell disaster for riders as well as the hoverboard’s pristine paint job. Additionally, the overall ride is a bit on the bumpy side, even on synthetic rubberized surfaces. Larger rubber tires would certainly help with the shock absorption and increase the traction, but then again there are models on the market with these features for those so inclined. Like many other models with smaller tires, the Swagboard T1 is more of an indoor vehicle than any true multi-terrain marauder, but it handles well-paved surfaces proficiently. Just be careful when transitioning from one surface to another, especially any surface with thicker concrete ridges. We’ve tested electric bicycles, electric mountain bikes, electric skateboards, and self-balancing scooters and if there’s one similarity across the board for all of these products it’s been substantially exaggerated range estimates. Unfortunately, the Swagboard T1 is no different. While Swangtron claims the Swagboard T1 has a range of 11 miles, we never traveled farther than 4 miles on a single charge. Furthermore, the battery readout actually began blinking red and beeping at around the three-mile marker. The hoverboard market is just too competitive at the moment to rationalize this price tag alongside this boring spec sheet. Regardless, we kept chugging along (incessant beeping underfoot) for another mile. It’s at least important to note that even during this last mile, there was no noticeable power fade, even on steeper inclines. Similar to the MegaWheels model we tested, the battery indicator is nearly useless to be perfectly blunt. The small battery shaped light will blink yellow as it charges and then turns green to indicate that the hoverboard is fully charged and flash entirely red when the battery is depleted or nearly depleted. Unfortunately, there’s no middle ground whatsoever and the indicator either exists as fully green or blinking red meaning there’s absolutely no way to tell if there’s a full charge or you’re rolling on fumes. As is the case with any unreliable rideable, gauge your mileage the first couple go-arounds and once you have a feel for the per charge range you’ll know when to turn around. At $250, the Swagtron Swagboard T1 has certainly placed itself above more affordable competitors priced under $150. In all honesty, it’s somewhat difficult to rationalize this price tag at the moment. More and more models are incorporating speakers, beefier wheels for stability, and plenty of room for personalization. Some app-enabled models allows riders to customize the LED lighting for further personalization. Just for comparison sake, Swagtron is currently offering the Vibe with both this built-in Bluetooth speaker, a companion app, and sleeker LEDs for $200. Without a Bluetooth speaker, or app, and a rather traditional build, the Swagboard T1 unit literally does nothing to stand out in a competitive crowd. At one point in time, folks were left to choose between only a handful of hoverboard makes and models. Now, there’s page after page of full of offerings to choose from on Amazon which is great for consumers on the hoverboard hunt, but this process is all about gauging comparative product specs. Purchasing any rideable, especially a hoverboard, is all about finding the sweet spot for each consumer based on use and needs. Like many other models with smaller tires, the Swagboard T1 is more of an indoor vehicle than a true multi-terrain marauder, but it handles well-paved surfaces proficiently. As mentioned previously, the Swagboard looks almost identical to the $230 (MSRP) MegaWheels Hoverboard down to the total LEDs and even the shape of the headlights. Without a keen eye or a triple-take, these two models are impossible to differentiate outside of the color scheme. While the Swagboard T1 did manage to double the per-charge mileage of the MegaWheels Hoverboard during our tests, the MegaWheels model boasts a Bluetooth speaker as a deal sweetener. Read more reviews of the best hoverboards available to purchase online. Not enough features to justify the price. For a device with minimal LEDs, no Bluetooth speaker, or Bluetooth connectivity the Swagboard T1 has nothing going for it other than range and ride. The hoverboard market is just too competitive at the moment to rationalize the $250 price tag alongside this boring spec sheet. Product Dimensions 23 x 4 x 7 in. Max rider weight 220 lbs. Minimum rider weight 44 lbs.